When Ron Stenson was recovering from hip replacement surgery at Saddleback Memorial Medical Center last December, he wondered if he might have offended someone on the staff. "They put me in a room by myself so I thought I was on the 'naughty list,' " he said. 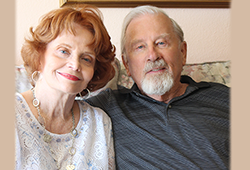 Turns out, as a member of Saddleback Memorial Foundation's Heritage Society (donors who have included the Foundation in their will or estate plans), Ron was able to recover in a private room while he was being cared for by the physicians and nurses. He still jokes about the surgery: "I'm going to get all of us together in Laguna Woods who have had the same surgery, and we'll put on our own Woodstock event, you know, because we're all 'hippies. ' "
That sense of humor is always near the surface for the New York native, even as he encounters strangers throughout the day. In fact, you would probably find him kidding around just about anytime, anywhere. "No speeding," he'll quip to a man he sees at the store with a walker. "It makes them laugh and it brings a smile to my face. I like to give people a little attention." He remembers receiving a great deal of kindness and attention when he was a patient at Saddleback Memorial, for his surgery last year and for previous visits to have a pacemaker implanted. That stellar care was part of the reason he decided to include Saddleback Memorial Foundation in his will. "I just feel like they treated me well," he said. "So I thought it would be good to donate to the hospital. You know, many things make for a good life. Being healthy is certainly one of the most. The hospital is indeed vital and well worth any contribution from anyone." One person helping him make a good life is Jan MacKenzie, who he met after moving to Laguna Woods in 1998. She's been his better half for 15 years. The couple stays busy cruising, and attending parties and events, where they often meet new people. And when they do, Ron is always ready with a punchline.